Sometimes you might want to create an environment that really captures the identity of your company. We believe that an office wall can say as much about a business as any other form of communication. Large format digitally printed wall vinyl can really boost the creativity and productivity of your team. We were fortunate to work with a number of companies to help achieve these branding goals. Finance of America Mortgage, LLC is a business dedicated to helping its customers obtain home mortgage loans. They came to Egan Sign wanting something dramatic to stand out in their Philadelphia suburbs corporate office. Egan Sign came up with a mural of the Philadelphia skyline because of its proximity to Philadelphia. We developed the image and Finance of America Mortgage loved the concept. 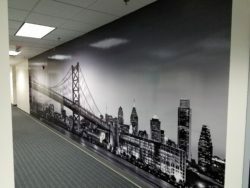 This large format digitally printed wall vinyl size is 20’ long by 8’ high printed in black and white to create a dramatic effect. Amedisys Inc. provides home health care, hospice services and personal care to those in need of assistance. Egan sign created a colorful photographic wall mural to compliment their newly renovated offices. This large format digitally printed wall vinyl is 20’ long by 9’ high. Digitally printing this image really makes the color pop on the wall and creates a dramatic environment. General Mills’ slogan is “making food people love.” They also believe they should make their offices a place where their employees love to work. General Mills decided to use a variety of designs throughout their offices on a number of walls. 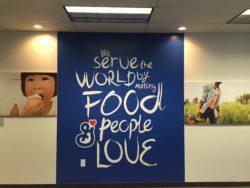 They asked Egan Sign to print and install these wall graphics in four of their office locations. 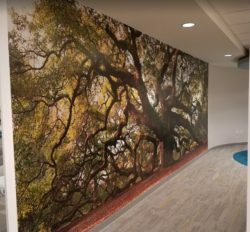 Large format digitally printed wall vinyl has a relatively easy preparation for installation. The walls require cleaning and patching of any existing holes. The vinyl is typically printed in four foot panels and installed in sections. There are a number of textures that can be utilized to create the specific look you want in your office. Follow Egan Sign on Facebook, Twitter, and LinkedIn for updates on the company and what’s new in the sign industry!